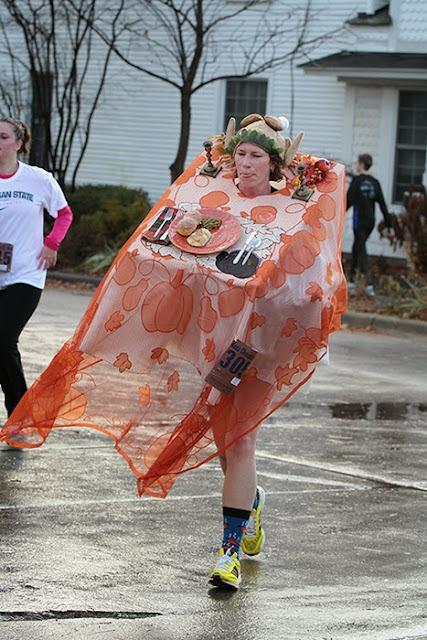 I've run in all sorts of costumes in all sorts of weather. From floor-length gowns to full-course Thanksgiving dinners, from steamy 80+F temps to sub-zero icy conditions, it's all fun! Here are a few things I've learned through boppin' around in costumes. Safety pins are a necessity for costume running! I have a stash of small, medium, and large safety pins so I have the right pin for whatever needs to be put in place. 99% of the time the medium-sized pins — the kind you get when you pick up your bib — work out just peachy. A small pin is nice if you don't want to puncture a big hole, while large pin is good for getting through tough fabric. Wig caps are extremely helpful in keeping the wig in place. They typically run $1-2 and are well worth it. Use bobby pins to secure the wig to the wig cap. I usually put 2-3 bobby pins in the front, two in the back, and one behind each ear. For giant poofy wigs, poly stuffing can be found in craft stores and works well for getting that extra volume. If you're looking for something besides fake hair, tinsel wigs are light and cheap, costing around $5. Long earrings and necklaces of any size are apt to bounce around and potentially smack you in the face (ouch!) Sunglasses are good in this situation to help protect your eyes. Make sure you do a few short sprints before race time to see how things are going to swing around and if you need to make any adjustments. 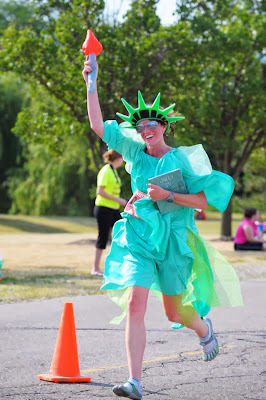 Red Carpet Run 5K, one of my fav races! Long dresses are gorgeous. Love 'em. 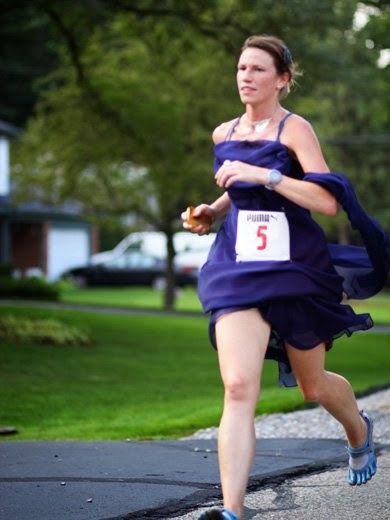 To prevent the long train getting caught up between the legs, you will need to pull up the dress with your hands and hold it up (hard to do, but makes for a great arm workout) or safety pin the bottom part of the dress up so you can open your stride. I do the latter. I sweat like crazy, so I don't put on very much makeup. A little eyeshadow is great for color, but be careful. I've put too much on and when it run into my eyes, it burned! 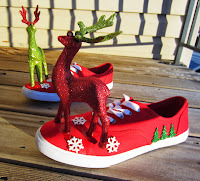 My shoes come from either Payless Shoes or Target. I'm a minimalist runner, so I look for a flat shoe with a thin sole. 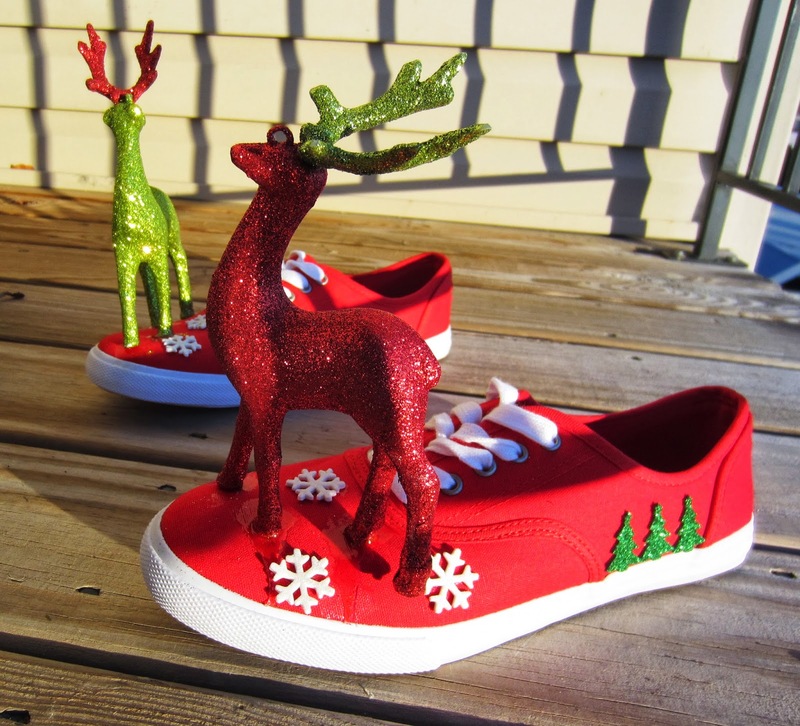 When adding decorative items, make sure your stride will not knock off the times or rub against your calves uncomfortably. I always bring a backup pair of shoes in case during warm-up they are uncomfortable. If it's really hot or really cold, adjust your expectations accordingly. Keep in mind that an extra layer on hot day will slow you down and that you'll need extra water. Be smart about looking fabulous! You can tell if you're dehydrated by pinching the back of your hand. If the skin stays tented, you're dehydrated and need more water — with electrolytes if that's available — pronto! This is very important! A half mile test run before the race will show you what's not working (sunglasses not staying on, something needs to be pinned, etc.) and allow to time to make changes before you're out in the course. Even more important than doing a test run! I love seeing the creativity that comes from people that dress up for a race. You will be bringing smiles and happiness to other people, and that is awesome.